The following collection of news items are in reverse chronological order. 03/06/19: Paper Accepted to ACM CF 2019 Cui and Feng have their paper — Iterative Machine Learning (IterML) for Effective Parameter Pruning and Tuning in Accelerators — accepted for publication in the 16th ACM International Conference on Computing Frontiers to be held in Alghero, Sardinia, Italy in April-May 2019. 12/22/18 : Paper Accepted to Frontiers in Genetics Banerjee and Feng, in collaboration with Zhu, Tang, Wu, and Xie of Bradley Department of Electrical and Computer Engineering at Virginia Tech, have their paper — Identifying Transcriptional Regulatory Modules among Different Chromatin States in Mouse Neural Stem Cells — accepted for publication into Frontiers in Genetics, section Epigenomics and Epigenetics. 12/15/18 : Paper Accepted to Scientific Reports Dash and Feng, in collaboration with Anandakrishnan, Kinney, Varghese, and Garner of VCOM at Virginia Tech, have their paper — Differentiating Between Cancer and Normal Tissue Samples Using Multi-Hit Combinations of Genetic Mutations — accepted for publication into Scientific Reports (A Nature Research Journal). The 2017 journal metrics — 2-year impact factor: 4.122 and 5-year impact factor: 4.609. 10/31/18 : Paper Accepted to HPC Asia 2019 Sathre, Gardner, and Feng, have their paper — On the Portability of GPU-Accelerated Applications via Automated Source-to-Source Translation — accepted for publication at HPC Asia: International Conference on High Performance Computing in Asia-Pacific Region to be held in Guangzhou, China in January 2019. 10/05/18 : Papers Accepted to ReConFig 2018 Three papers — A Composable Workflow for Productive Heterogeneous Computing on FPGAs via Whole-Program Analysis and Transformation by Sathre, Helal, and Feng; Accelerating High-Performance Computing Workloads on FPGAs via OpenCL by Verma, Krommydas, and Feng; and Exploring FPGA-specific Optimizations for Irregular OpenCL Applications by Hassan, Helal, and Feng, in collaboration with Athanas and Hanafy of ECE — have been accepted for publication at the International Conference on Reconfigurable Computing and FPGAs (ReConFig) to be held in Cancun, Mexico on December 3-5, 2018. 08/17/18 : Best Poster Award at ICPP 2018 Congratulations to Sarunya (“Kwang”) Pumma for getting her poster, “I/O Bottleneck Investigation in Deep Learning Systems,” selected as the Best Student Poster at the 47th International Conference on Parallel Processing. 08/17/18 : The 9th Doctoral Degree from the Synergy Lab Official congratulations to Dr. Kaixi Hou for receiving his PhD degree for "Exploring Performance Portability for Accelerators via High-level Parallel Patterns." He started his direct Ph.D. degree in 2013 and is the 9th awardee of the Synergy Lab. Best wishes to him on his Software Engineer position at NVIDIA! 07/25/18 : Paper Accepted to Software X Feng, in collaboration with McCaskey, Dumitrescu, Liakh, Humble of Oak Ridge National Laboratory, and Chen of Department of Physics at Virginia Tech, have their paper — A Language and Hardware Independent Approach to Quantum–classical Computing — accepted for publication at SoftwareX. 06/18/18 : Posters Accepted to ICPP 2018 Congratulations to Vignesh Adhinaryanan, Sajal Dash, and Sarunya Pumma for getting their work accepted into the Ph.D. Forum at the 47th International Conference on Parallel Processing to be held August 13-16, 2018. As part of the acceptance to the program, each will be awarded with a conference registration grant, courtesy of NSF. 05/21/18 : End of Tour Award Winner Congratulations to Ahmed Helal for being selected as one of three worldwide winners of the “End of Tour Award” for the spring at AMD! 05/14/18 : Paper Accepted to ICPP 2018 Krommydas, Sathre, and Feng, in collaboration with Sasanka of Intel, have their paper — A Framework for Auto-Parallelization and Code Generation: An Integrative Case Study with Legacy FORTRAN Codes — accepted for publication at the 47th International Conference on Parallel Processing to be held in Eugene, OR in August 2018. 04/24/18 : Paper Accepted to ACM HPDC 2018 Helal, Jung, Hanafy, and Feng have their paper — Automated Estimation of Communication Cost and Scalability on HPC Clusters from Sequential Code — accepted for publication in the 27th International ACM Symposium on High-Performance Parallel and Distributed Computing (HPDC) to be held in Tempe, Arizona in June 2018. 03/09/18 : Papers Accepted to ACM CF 2018 Zhang, Wang, and Feng, in collaboration with Aji and Chu of AMD, have their paper — Taming Irregular Applications via Dynamic Parallelism: How Far Have We Come? — accepted for publication in the 15th ACM International Conference on Computing Frontiers (CF’18) to be held in Ischia, Italy, May 2018. Likewise, Dutta, Adhinarayanan, and Feng, have their paper — GPU Power Prediction via Ensemble Machine Learning for DVFS Space Exploration — accepted for publication in the 15th ACM International Conference on Computing Frontiers (CF’18) to be held in Ischia, Italy, May 2018. 03/06/18 : Paper Accepted to HPPAC 2018 Adhinarayanan, Dutta, and Feng, have their paper — Making a Case for Green High-Performance Visualization via Embedded Graphics Processors — accepted for publication in the 14th Workshop on High-Performance, Power-Aware Computing (HPPAC'18) to be held in conjunction with the 32nd IEEE International Parallel and Distributed Processing Symposium in Vancouver, British Columbia, Canada, May 2018. 02/09/18 : MS Graduate from the Synergy Lab Congratulations to Anshuman Verma for receiving his MS degree for "On the Programmability and Performance of OpenCL designs for FPGA." Verma started in 2015 and finished his degree in 2017. Best wishes to him on his Hardware Engineer position at Microsoft! 02/06/18 : MS Graduate from the Synergy Lab Congratulations to Bishwajit Dutta for receiving his MS degree for "Power Analysis and Prediction for Heterogeneous Computation." Best wishes to him on his Software Pathfinding Engineer position at Intel! 02/01/18 : The 8th Doctoral Degree from the Synergy Lab Official congratulations to Dr. Jing Zhang for receiving his PhD degree for "Transforming and Optimizing Irregular Applications for Parallel Architectures." He is the 8th awardee of the Synergy Lab. Best wishes to him on his Member of Technical Staff (MTS) Software Engineer position at AMD! 12/28/17 : Paper Accepted to IEEE TPDS Hou, Wang, and Feng, have their paper — A Framework for the Automatic Vectorization of Parallel Sort on x86-based Processors — accepted for publication in a future issue of IEEE Transactions on Parallel and Distributed Systems (TPDS). 12/14/17 : Paper Accepted to IEEE IPDPS 2018 Hou, Wang, and Feng, in collaboration with Vetter and Lee of Oak Ridge National Laboratory, have their paper — Highly Efﬁcient Compensation-based Parallelism for Wavefront Loops on GPUs — accepted for publication in the IEEE International Parallel and Distributed Processing Symposium (IPDPS) to be held in Vancouver, British Columbia, Canada in May 2018. 11/13/17 : Feng Delivers Keynote at E2SC Feng provided the opening keynote speech entitled "Confessions of an Accidental Greenie: From Green Destiny to the Green500 and Beyond" at the SC’17 Workshop on Energy-Efficient Supercomputing (E2SC) in Denver, in November 2017. 10/12/17 : Paper Accepted to IEEE BigData 2017 Yu, Hou, Wang, and Feng have their paper — Robotomata: A Framework for Approximate Pattern Matching of Big Data on an Automata Processor — accepted as a regular paper at the IEEE Big Data to be held in Boston, MA, USA on December 11-14, 2017. 09/08/17 : IEEE IISWC 2017 Student Travel Award Congratulations to Ahmed Helal for being awarded a student travel award ($400) to attend the IEEE International Symposium on Workload Characterization in Seattle, Washington in October 2017. 09/04/17 : Poster Accepted to ACM/IEEE SC | 17 Cui, and Feng, in collaboration with Scogland, de Supinski, at Lawrence Livermore National Laboratory, have their poster — Performance Evaluation of the NVIDIA Tesla P100: Our Directive-Based Partitioning and Pipelining vs. NVIDIA’s Unified Memory — accepted for publication at SC|17: The International Conference for High Performance Computing, Networking, Storage and Analysis to be held in Denver, Colorado, USA in November 2017. 09/01/17 : Paper Accepted to IEEE ICPADS 2017 Pumma, and Feng, in collaboration with Si and Balaji at Argonne National Laboratory have their paper — Parallel I/O Optimizations for Scalable Deep Learning — accepted for publication at the IEEE International Conference on Parallel and Distributed Systems (ICPADS) to be held in Shenzhen, China in December 2017. 08/17/17 : Best Paper Finalist at IEEE HPCC 2017 Dash, Verma, and Feng, in collaboration with Prof. Chris North of CS@VT, have their paper — Portable Parallel Design of Weighted Multi-Dimensional Scaling for Real-Time Data Analysis — selected as one of five Best Paper Finalists at the IEEE International Conference on High Performance Computing and Communications (HPCC) to be held in Bangkok, Thailand in December 2017. 08/10/17 : The 7th Doctoral Degree from the Synergy Lab Congratulations to Dr. Umar Kalim for earning his PhD degree for "Cognizant Networks: A Model and Framework for Session-based Communications and Adaptive Networking.” He is the 7th awardee of the Synergy Lab, which started in 2006. Best wishes to him as he embarks on a career at Stanford Linear Accelerator Center! 08/01/17 : Poster Accepted to IEEE IISWC 2017 Yu, Hou, Wang, and Feng have their poster — A Framework for Fast and Fair Evaluation of Automata Processing Hardware — accepted for publication into the IEEE International Symposium on Workload Characterization (IISWC), to be held in Seattle, WA in October 2017. 08/01/17 : Paper Accepted to IEEE IISWC 2017 Helal and Feng, in collaboration with Jung (CS@VT) and Hanafy (ECE@VT), have their paper — An Automated Framework for Relative Performance Estimation and Workload Distribution on Heterogeneous HPC Systems — accepted for publication in the IEEE International Symposium on Workload Characterization (IISWC) to be held in Seattle, WA in October 2017. 04/24/17 : Paper Accepted to FTXS 2017 Kalim, Gardner, and Feng have their paper — A Non-Invasive Approach for Realizing Resilience in MPI — accepted for publication in the 7th Workshop on Fault Tolerance for HPC at eXtreme Scale (FTXS), in conjunction with the 26th ACM Symposium on High-Performance Parallel and Distributed Computing, to be held in Washington DC in June 2017. 04/23/17 : IEEE IPDPS 2017 Student Travel Awards Congratulations to Vignesh Adhinarayanan and Jing Zhang for each receiving $250 travel grants to travel to the IEEE International Parallel & Distributed Processing Symposium to be held in Orlando, FL in May-June 2017. 04/02/17 : Papers Accepted to ICS 2017 Hou, Wang, and Feng, in collaboration with Liu at Niels Bohr Institute have their paper — Fast Segmented Sort on GPUs — accepted for publication in the International Conference on Supercomputing (ICS) to be held in Chicago, IL in June 2017. Likewise, Yu and Feng, in collaboration with Nourian, Wang, and Becchi at the University of Missouri, also have their paper — Demystifying Automata Processing: GPUs, FPGAs or Micron’s AP? — accepted for publication in the International Conference on Supercomputing (ICS) to be held in Chicago, IL in June 2017. 03/14/17 : Papers Accepted to ACM Computing Frontiers 2017 Hou, Wang, and Feng have their paper — GPU-UniCache: Automatic Code Generation of Spatial Blocking for Stencils on GPUs — accepted for publication in the ACM International Conference on Computing Frontiers to be held in Siena, Italy in May 2017. Likewise, Yu, Wang, and Feng, in collaboration with Gong and Cao at the Department of Biomedical Engineering and Mechanics at Virginia Tech, also have their paper — An Enhanced Image Reconstruction Tool for Computed Tomography on GPUs — accepted for publication in the ACM International Conference on Computing Frontiers to be held in Siena, Italy in May 2017. 03/12/17 : Paper Accepted to ACM/IEEE ANCS 2017 Kalim, Gardner, Brown, and Feng have their paper — SLIM: Enabling Transparent Extensibility and Dynamic Configuration via Session-Layer Abstractions — accepted for publication in the 13th ACM/IEEE Symposium on Architectures for Networking and Communications Systems to be held in Beijing, China in May 2017. 03/02/17 : Paper Accepted to FGCS 2017 Pumma and Feng, in collaboration with Phunchongharn and Achalakul at King Mongkut’s University of Technology Thonburi, Thailand, and Chapeland at CERN, have their paper — A Runtime Estimation Framework for ALICE — accepted for publication in the Journal of Future Generation Computer Systems 2017. 02/23/17 : Paper Accepted to DAC Verma and Feng, in collaboration with Zhou of NCSU and Booth, King, Coole, Keep, and Marshall of Cisco, have their paper — Developing Dynamic Profiling and Debugging Support in OpenCL for FPGAs — accepted into the 54th Design Automation Conference (DAC) to be held in Austin, TX on June 18-22, 2017. 02/21/17 : Paper Accepted to AsHES 2017 Kaixi and Feng, in collaboration with Che at AMD, have their paper — Auto-Tuning Strategies for Parallelizing Sparse Matrix-Vector (SpMV) Multiplication on Multi- and Many-Core Processors — accepted for publication in the 7th International Workshop on Accelerators and Hybrid Exascale Systems (AsHES) to be held in Orlando, Florida in May 2017. 02/07/17 : Adhinarayanan Awarded Pratt Fellowship Congratulations to Vignesh Adhinarayanan for being awarded the Pratt Fellowship for Spring 2017! 01/16/17 : Paper Accepted to JPDC 2017 Special Issue on Pedagogy Feng, Gardner, and Feng have their paper — Parallel Programming with Pictures is a Snap! — accepted for publication in a special issue of the Journal of Parallel and Distributed Computing (JPDC) on Keeping up with Technology: Teaching Parallel, Distributed and High-Performance Computing, 2017. 01/09/17 : Papers Accepted to IEEE IPDPS 2017 Adhinarayanan and Feng, in collaboration with Rogers, Ahrens, and Pakin at Los Alamos National Laboratory, have their paper — Characterizing and Modeling Energy for Extreme-Scale In-Situ Visualization — and Cui and Feng, in collaboration with Scogland and de Supinski at Lawrence Livermore National Laboratory, have their paper — Directive-Based Partitioning and Pipelining for Graphics Processing Units and Zhang, Wang, and Feng, in collaboration with Misra at Intel, have their paper — Eliminating Irregularities of Protein Sequence Search on Multicore Architectures and Wang, Zhang, Zhang, Pumma, and Feng have their paper — PaPar: A Parallel Data Partitioning Framework for Big Data Applications — accepted for publication in the IEEE International Parallel and Distributed Processing Symposium to be held in Orlando, Florida, USA in May-June 2017. 01/02/17 : Paper Accepted to BiCoB 2017 Banerjee and Feng, in collaboration with Chen, Wu, Xie, and Xuan, have their paper — ChIP-GMM: A Gaussian Mixture Model for Inferring Binding Regions in ChIP-seq Profiles — accepted for publication in the 9th International Conference on Bioinformatics and Computational Biology (BiCoB) to be held in Honolulu, HI in March 2017. 12/10/16 : Poster Accepted to CGO 2017 Verma and Feng have their poster — Accelerating 3D-Structured Grid on FPGAs via OpenCL: A Case Study with OpenDwarfs — accepted into the Student Research Competition (SRC) at the International Symposium on Code Generation and Optimization (CGO), to be held in conjunction with the 22nd ACM SIGPLAN Symposium on Principles and Practice of Parallel Programming in Austin, TX in February 2017. 12/01/16 : The 6th Doctoral Degree from the Synergy Lab Congratulations to Dr. Konstantinos Krommydas for earning his PhD degree for "Towards Enhancing Performance, Programmability, and Portability in Heterogeneous Computing.” He is the 6th awardee of the Synergy Lab, which started in 2010. Best wishes to him as he embarks on a career at Intel! 11/04/16 : Paper Accepted to BMC Bioinformatics Zhang, Misra, Wang, and Feng have their paper — muBLASTP: Database-Indexed Protein Sequence Search on Multicore CPUs — accepted into BMC Bioinformatics. 09/06/16 : Paper Accepted to IEEE HiPC 2016 Krommydas and Feng have their paper — Telescoping Architectures: Evaluating Next-Generation Heterogeneous Computing — accepted for publication in the 23rd IEEE International Conference on High-Performance Computing, Data, and Analytics (HiPC) to be held in Hyderabad, India in December 2016. 08/11/16 : Paper Accepted to ACM BCB 2016 Feng, in collaboration with Anandakrishnan, Daga, and Onufriev, have their paper — Multiscale Approximation with Graphical Processing Units for Multiplicative Speedup in Molecular Dynamics — accepted for publication in the 7th ACM Conference on Bioinformatics, Computational Biology, and Health Informatics (ACM BCB) to be held in Seattle, Washington, USA in October, 2016. 08/08/16 : Kalim Accepted into ACM/IEEE SC|16 SCinet Volunteer Program Kalim has been accepted into the SCinet Volunteer Program at SC|16 to be held in Salt Lake City, UT in November 2016. 08/01/16 : Feng Selected as Steering Committee Chair and General Co-Chair for ICPP 2017 Feng has been selected as the Steering Committee Chair for the 46th International Conference on Parallel Processing (ICPP 2017). He will also be serving as General Co-Chair with Simon McIntosh-Smith. 08/01/16 : IEEE TPDS Article Featured in IEEE Computer Congratulations to Aji, Panwar, and Feng — in collaboration with Ji and Ma at North Carolina State University, Murthy, Chabbi, and Mellor-Crummey at Rice University, Bisset at Virginia Tech, Balaji, Dinan, and Thakur at Argonne National Laboratory — for having their IEEE TPDS article featured in the "Spotlight on Transactions" article, "Evolving MPI+X Towards Exascale," in IEEE Computer in August 2016. 07/20/16 : Paper Accepted to IEEE IISWC 2016 Adhinarayanan and Feng in collaboration with Indrani Paul, Joseph Greathouse, and Wei Huang at AMD and Ashutosh Pattnaik at Penn State have their paper — Measuring and Modeling On-Chip Interconnect Power on Real Hardware — accepted for publication in IEEE International Symposium on Workload Characterization (IISWC) to be held in Providence, Rhode Island, USA, in September 2016. 07/06/16 : Pumma Accepted into ACM/IEEE SC|16 Student Volunteer Program Pumma has been accepted into the student volunteer program at SC|16 to be held in Salt Lake City, UT in November 2016. 06/28/16 : Paper Accepted to IEEE MASCOTS 2016 Harb and Feng have their paper — Characterizing Performance and Power Towards Efficient Synchronization of GPU Kernels — accepted for publication as a short paper in the IEEE 24th International Symposium on Modeling, Analysis and Simulation of Computer and Telecommunication Systems (MASCOTS), to be held in London, England in September 2016. 06/15/16 : Paper Accepted to ACM/IEEE SC|16 Helal, Sathre and Feng have their paper — MetaMorph: A Library Framework for Interoperable Kernels on Multi- and Many-core Clusters — accepted for publication in ACM/IEEE Supercomputing, to be held in Salt Lake City, UT in November 2016. 04/29/16 : Paper Accepted to IEEE ASAP 2016 Krommydas and Feng, in collaboration with Sasanka at Intel, have their paper — Bridging the FPGA Programmability-Portability Gap via Automatic OpenCL Code Generation and Tuning — accepted into the 27th IEEE International Conference on Application-specific Systems, Architectures and Processors (ASAP), to be held in London, England in July 2016. 04/27/16 : Yu Receives Outstanding GTA Award The Department of Computer Science at Virginia Tech selects Yu as the Outstanding Graduate Teaching Assistant (GTA) of 2015-16. 03/22/16 : Paper Accepted to ICS 2016 Wang, Hou and Feng, in collaboration with Liu at University of Copenhagen, have their paper — Parallel Transposition of Sparse Data Structures — accepted into the 30th International Conference on Supercomputing (ICS) to be held in Istanbul, Turkey in June 2016. 03/16/16 : Poster Accepted to IEEE FCCM 2016 Krommydas, Helal, Verma, and Feng have their poster — Bridging the Performance-Programmability Gap for FPGAs via OpenCL: A Case Study with OpenDwarfs — accepted for publication into the 24th IEEE International Symposium on Field-Programmable Custom Computing Machines, to be held in Washington DC, in May 2016. 02/23/16 : Paper Accepted to HPPAC 2016 Feng and lead-collaborator Chung-Hsing Hsu at Oak Ridge National Laboratory have their paper — The Right Metric for Efficient Supercomputing: A Ten-Year Retrospective — accepted into the 12th Workshop on High-Performance, Power-Aware Computing (HPPAC), to be held in conjunction with the 30th IEEE International Parallel and Distributed Processing Symposium (IPDPS) in Chicago, IL, USA in May 2016. 02/23/16 : Paper Accepted to EduPar 2016 Feng and Feng have their paper — Parallel Programming with Pictures in a Snap! — accepted for publication into the 6th NSF/TCPP Workshop on Parallel and Distributed Computing Education (EduPar-16), to be held in conjunction with the IEEE International Parallel and Distributed Processing Symposium (IPDPS) in Chicago, IL, USA, in May 2016. 01/20/16 : Papers Accepted to IEEE/ACM CCGrid 2016 Adhinarayanan and Feng, in collaboration with Subramaniam at Argonne National Laboratory, have their paper — Online Power Estimation of Graphics Processing Units — and Yu and Feng, in collaboration with Gong and Cao at School of Biomedical Engineering and Sciences, have their paper — cuART: Fine-Grained Image Reconstruction Algorithm of ART-Based Computed Tomography on GPUs — accepted into the 16th IEEE/ACM International Symposium on Cluster, Cloud and Grid Computing (CCGrid), to be held in Cartagena, Colombia, in May 2016. 01/19/16 : Paper Accepted to IEEE ISPASS 2016 Adhinarayanan and Feng have their paper — An Automated Framework for Characterizing and Subsetting GPGPU Workloads — accepted into the IEEE International Symposium on Performance Analysis of Systems and Software (ISPASS), to be held in Uppsala, Sweden, in April 2016. 06/01/13 : Paper Accepted to OMICS 2014 Feng, in collaboration with Eugene, Vural, Lennart, et al., have their paper — Toward More Transparent and Reproducible OMICS Studies Through a Common Metadata Checklist and Data Publications — accepted for publication in OMICS: A Journal of Integrative Biology, January 2014. 12/22/15 : Paper Accepted to ACM/IEEE ANCS 2016 Yu and Feng, in collaboration with Yao at Virginia Tech and Becchi at University of Missouri, have their paper — O3FA: A Scalable, Finite Automata-based, Pattern-Matching Engine for Out-of-Order Packet Inspection in IDS — accepted into the 12th ACM/IEEE Symposium on Architectures for Networking and Communications Systems (ANCS), to be held in Santa Clara, CA, USA in March 2016. 12/18/15 : Paper Accepted to IEEE IPDPS 2016 Hou, Wang and Feng have their paper — AAlign: A SIMD Framework for Pairwise Sequence Alignment on x86-based Multi- and Many-core Processors — accepted into the IEEE International Parallel and Distributed Processing Symposium (IPDPS), to be held in Chicago, IL, USA in May 2016. 11/04/15 : Paper Accepted to IEEE TIFS Shu, Zhang, Yao and Feng have their paper — Fast Detection of Transformed Data Leaks — accepted for publication in IEEE Transactions on Information Forensics and Security (TIFS). 09/09/15 : Paper Accepted to IEEE/ACM TCBB Zhang, Wang and Feng have their paper — cuBLASTP: Fine-Grained Parallelization of Protein Sequence Search on CPU+GPU — accepted for publication in IEEE/ACM Transactions on Computational Biology and Bioinformatics (TCBB). 09/09/15 : Posters Accepted to ACM/IEEE SC|15 Adhinarayanan and Feng, in collaboration with Ahrens, Pakin, and Rogers at Los Alamos National Laboratory, have their poster — Performance, Power, and Energy of In-Situ and Post-Processing Visualization: A Case Study in Climate Simulation — Cui and Feng, in collaboration with de Supinski and Scogland at Lawrence Livermore National Laboratory, have their poster — Directive-Based Pipelining Extension for OpenMP — and A. Feng, Tilevich, and Feng have their poster — PPP: Parallel Programming with Pictures — accepted for publication in ACM/IEEE Supercomputing, to be held in Austin, TX, USA in November, 2015. 09/01/15 : Paper Accepted to IEEE ICCABS 2015 Zhang, Wang, Hou, Zhang and Feng have their paper — Accelerating InDel Detection on Modern Multi-Core SIMD CPU Architecture — accepted into the 5th IEEE International Conference on Computational Advances in Bio and Medical Sciences (ICCABS), to be held in Miami, FL, USA in October, 2015. 09/01/15 : The 5th Doctoral Degree from the Synergy Lab Congratulations to Dr. Balaji Subramaniam for receiving his PhD degree for "Metrics, Models and Methodologies for Energy-Proportional Computing.” He is the 5th awardee of the Synergy Lab. Best wishes to him as he embarks on a career at Argonne National Laboratory! 07/08/15 : Paper Accepted to Blocks and Beyond 2015 Feng, Tilevich, and Feng have their paper — Block-Based Programming Abstractions for Explicit Parallel Computing — accepted into Blocks and Beyond, a select workshop of the IEEE Symposium on Visual Languages and Human-Centric Computing, to be held in Atlanta, GA, USA in October, 2015. 05/09/15 : Paper Accepted to ICPP 2015 Krommydas, Sasanka, and Feng have their paper — GLAF: A Visual Programming and Auto-Tuning Framework for Parallel Computing — accepted into the 44th International Conference on Parallel Processing (ICPP) to be held Beijing, China in September, 2015. 05/01/15 : The 4th Doctoral Degree from the Synergy Lab Congratulations to Dr. Ashwin Aji for earning his PhD degree for "Programming High-Performance Clusters with Heterogeneous Computing Devices.” He is the 4th PhD graduate of the Synergy Lab. We wish him all the best on his new job at AMD Research! 05/01/15 : MS Graduate from the Synergy Lab Congratulations to Rubasri Kalidas for receiving her MS degree. Best wishes to her on her new job at Intel! 04/08/15 : IEEE IPDPS 2015 Student Travel Awards Adhinarayanan and Kalidas each receives an IPDPS Student Travel Award to present their research paper at IEEE IPDPS 2015, to be held in Hyderabad, India in May 2015. 04/07/15 : Paper Published in Computers and Fluids 2015 Scogland and Feng in collaboration with lead authors Pickering, Jackson and Roy at the Department of Aerospace and Ocean Engineering, have their paper — Directive-Based GPU Programming for Computational Fluid Dynamics— published in Computers and Fluids, 2015. 03/17/15 : Subramaniam Receives Outstanding Doctoral Student Award The College of Engineering at Virginia Tech selects Subramaniam as the Outstanding Doctoral Student of 2015. 03/15/15 : Paper Accepted to ICS 2015 Hou, Wang and Feng have their paper — ASPaS: A Framework for Automatic SIMDization of Parallel Sorting on x86-based Many-core Processors — accepted into the 29th International Conference on Supercomputing to be held in Newport Beach, CA, USA in June, 2015. 03/04/15 : Best Poster Award at ACM CODASPY 2015 Zhang and Feng, in collaboration with lead authors Shu and Yao of Virginia Tech, receive the Best Poster Award for their work on — Rapid Screening of Transformed Data Leaks with Efficient Algorithms and Parallel Computing — at the 5th ACM Conference on Data and Application Security and Privacy held in San Antonio, TX, USA in March 2015. 02/20/15 : Data-Access Paper Accepted to HPPAC 2015 Adhinarayanan and Feng have their paper — On the Greenness of In-Situ and Post-Processing Visualization Pipelines — and Kalidas and Feng have their paper — On the Performance, Energy, and Power of Data-Access Methods in Heterogeneous Computing Systems — accepted into the 11th workshop on High-Performance, Power-Aware Computing (HPPAC), in conjunction with the 29th International Parallel and Distributed Processing Symposium, to be held in Hyderabad, India, in May 2015. 02/20/15 : Green Viz Paper Accepted to HPPAC 2015 Adhinarayanan and Feng, in conjunction with Woodring, Rogers, and Ahrens from Los Alamos National Laboratory, have their paper — On the Greenness of In-Situ and Post-Processing Visualization Pipelines — accepted into the 11th Workshop on High-Performance, Power-Aware Computing (HPPAC), in conjunction with the 29th International Parallel and Distributed Processing Symposium, to be held in Hyderabad, India, in May 2015. 01/29/15 : Zhang Awarded Pratt Fellowship Congratulations to Jing Zhang for being awarded the Pratt Fellowship for the Department of Computer Science. 01/07/15 : Feng Publishes "The Green Computing Book" Feng publishes a book of edited chapters in The Green Computing Book: Tackling Energy Efficiency at Large Scale. This book discusses approaches to advance the state of the art in large-scale green computing. 01/01/15 : The 3rd Doctoral Degree from the Synergy Lab Congratulations to Dr. Thomas Scogland for earning his PhD degree for "Runtime Adaptation for Autonomic Heterogeneous Computing.” He is the 3rd awardee of the Synergy Lab. We wish him the best of luck on his new job at Lawrence Livermore National Laboratory! 11/05/14 : Paper Accepted to PMBS 2014 Subramaniam and Feng have their paper — On the Energy Proportionality of Distributed NoSQL Data Stores — accepted into the 5th International Workshop on Performance Modeling, Benchmarking and Simulation of High Performance Computer Systems (PMBS14), in conjunction with SC14, to be held in New Orleans, LA, in November 2014. 10/16/14 : Paper Accepted to ACM/SPEC ICPE 2015 Scogland and Feng have their paper — Design and Evaluation of Scalable Concurrent Queues for Many-Core Architectures — accepted into the ACM International Conference on Performance Engineering (ICPE) to be held in Austin, TX in January, 2015. 09/30/14 : Paper Accepted to ReConFig 2014 Adhinarayanan and Feng, in collaboration with Koehn, Kepa, and Peter Athanas, have their paper — On the Performance and Energy Efficiency of FPGAs and GPUs for Polyphase Channelization — accepted into ReConFig 2014 to be held in Cancun, Mexico, in December 2014. 09/30/14 : Paper Accepted to IEEE TPDS Scogland and Feng, in collaboration with de Supinski and Rountree from Lawrence Livermore National Laboratory, have their paper — CoreTSAR: Core Task-Size Adapting Runtime — accepted into the IEEE Transactions on Parallel and Distributed Systems. 09/05/14 : Poster Accepted to ACM/IEEE SC|14 Sathre and Feng have their poster — MetaMorph: A Modular Library for Democratizing the Acceleration of Parallel Computing across Heterogeneous Devices — accepted into the ACM/IEEE Supercomputing to be held in New Orleans, LA in November, 2014. 07/10/14 : Paper Accepted to BDSE 2014 Mohamed, Maji, Zhang, Timoshevskaya and Feng have their paper — Aeromancer: A Workﬂow Manager for Large-Scale MapReduce-Based Scientific Workflows — accepted into the 3rd IEEE International Conference on Big Data Science and Engineering (BDSE) to be held in Beijing, China in September, 2014. 06/28/14 : Poster Accepted to PACT 2014 Scogland and Feng have their poster — Locality-Aware Memory Association for Multi-Target Worksharing in OpenMP — accepted into the 23rd International Conference on Parallel Architectures and Compilation Techniques to be held in Edmonton, Alberta, Canada in August 2014. 6/19/14 : Best Paper Finalist at IEEE ASAP 2014 Krommydas and Feng, in collaboration with Owaida, Antonopoulos, and Bellas, have their paper — On the Portability of OpenCL Dwarfs on Fixed and Reconfigurable Parallel Platforms — selected as a Best Paper Finalist at the 25th IEEE International Conference on Application-specific Systems, Architectures and Processors, held in Zurich, Switzerland in June 2014. 6/19/14 : Subramaniam Receives NSF-funded Student Travel Grant to Participate in the Heidelberg Laureate Forum Subramaniam receives an NSF-funded Student Travel Grant to participate in the Heidelberg Laureate Forum to be held September, 2014 in Heidelberg, Germany. This grant is administered by Oak Ridge Associated Universities (ORAU). 6/19/14 : Subramaniam Receives NSF-funded Student Travel Grant to Participate in the Heidelberg Laureate Forum Subramaniam receives an NSF-funded Student Travel Grant to participate in the Heidelberg Laureate Forum to be held in September, 2014 in Heidelberg, Germany. This grant is administered by Oak Ridge Associated Universities (ORAU). 05/29/14 : Subramaniam Receives Best Student Research Innovation Award at IEEE/ACM CCGrid 2014 Subramaniam receives the Best Student Research Innovation Award at the PhD Forum at the IEEE/ACM International Symposium on Cluster, Cloud, and Grid Computing (CCGrid), held in Chicago, IL, USA in May 2014. 05/17/14 : del Mundo Places 3rd in Grand Finals of the ACM Student Research Competition (SRC) 2014 del Mundo places 3rd in the Grand Finals of the 2014 ACM Student Research Competition (SRC), which will be bestowed at the ACM Awards Banquet in San Francisco, CA on June 21, 2014. 05/15/14 : Subramaniam Selected to Participate in the Heidelberg Laureate Forum Subramaniam selected to participate in the 2nd Heidelberg Laureate Forum to be held in September, 2014 in Heidelberg, Germany. He is among 200 of the most qualified "Young Researchers" that the Scientific Committee of the Heidelberg Laureate Forum Foundation (HLFF) selected to participate. 05/08/14 : Paper Accepted to P2S2 2014 Hou, Wang and Feng have their paper — Delivering Parallel Programmability to the Masses via the Intel MIC Ecosystem: A Case Study — accepted into the 7th International Workshop on Parallel Programming Models and Systems Software for High-End Computing (P2S2) in conjunction with the 43rd International Conference on Parallel Processing to be held in Minneapolis, Minnesota in September, 2014. 04/30/14 : Paper Accepted to IEEE ICCABS 2014 Timoshevskaya and Feng have their paper — SAIS-OPT: On the Characterization and Optimization of the SA-IS Algorithm for Suffix Array Construction — accepted into the 4th IEEE International Conference on Computational Advanced in Bio and Medical Sciences (ICCABS) to be held in Miami Beach, FL in June, 2014. 04/24/14 : Best Undergraduate Poster Award at VTURCS 2014 del Mundo receives the Best Undergraduate Poster Award at the Virginia Tech Undergraduate Research in Computer Science (VTURCS) Research Symposium 2014, as selected by the CS@VT faculty. His poster has also been awarded 3rd place in the competition for People's Choice Award. 04/22/14 : Panwar Receives Outstanding M.S. Student Award The Department of Computer Science at Virginia Tech selects Panwar as the Outstanding M.S. Student of 2014. 04/13/14 : Paper Accepted to IEEE ASAP 2014 Krommydas and Feng have their paper — On the Portability of OpenCL Dwarfs on Fixed and Reconfigurable Parallel Platforms — accepted into the 25th IEEE International Conference on Application-specific Systems, Architectures and Processors (ASAP) to be held in Zurich, Switzerland in June, 2014. 04/08/14 : Subramaniam Receives NSF-funded Student Travel Grant Subramaniam receives an NSF-funded Student Travel Grant to present his thesis to the PhD Forum at IEEE/ACM CCGrid to be held in Chicago, IL in May 2014. 03/12/14 : Aji Receives NSF-TCPP Student Travel Grant Aji receives the NSF-TCPP Student Travel Grant to present his thesis to the PhD Forum at IEEE IPDPS to be held in Phoenix, AZ in May 2014. 03/10/14 : IEEE IPDPS 2014 Student Travel Awards Scogland and Subramaniam each receives an IPDPS Student Travel Award to present their theses to the PhD Forum at IEEE IPDPS 2014 to be held in Phoenix, AZ in May 2014. 03/10/14 : Paper Accepted to ISC 2014 Scogland and Feng in collaboration with Bronis de Supinski and Barry Rountree of Lawrence Livermore National Laboratory have their paper — CoreTSAR: Adaptive Worksharing for Heterogeneous Systems — accepted into the International Supercomputing Conference to be held in Leipzig, Germany in June 2014. 03/02/14 : Papers Accepted to IEEE/ACM CCGrid Doctoral Symposium 2014 Scogland and Subramaniam have their papers, (1) Runtime Adaptation for Autonomic Heterogeneous Computing — and (2) Metrics, Models and Methodologies for Energy-Proportional Computing — respectively, accepted into the IEEE/ACM CCGrid Doctoral Symposium to be held in Chicago, IL, USA in May 2014. 02/24/14 : Paper Accepted to ACM CF 2014 del Mundo and Feng have their paper — Towards a Performance-Portable FFT Library for Heterogeneous Computing — accepted into the ACM International Conference on Computing Frontiers (CF) to be held in Cagliari, Italy in May 2014. 02/24/14 : Paper Accepted to 5th ACM/SPEC ICPE 2014 Scogland and Feng in collaboration with Steffen at University of Illinois, Wilde at Leibniz-Rechenzentrum (LRZ), Parent at Calcul Quebec, Coghlan at Argonne National Laboratory, Bates at Energy-Efficient High-Performance Computing Working Group and Strohmaier at Lawrence Berkeley National Laboratory have their paper — A Power-Measurement Methodology for Large-Scale, High-Performance Computing — accepted into the 5th ACM International Conference on Performance Engineering (ICPE), to be held in Dublin, Ireland in March, 2014. The paper is nominated for the "Best Industrial Paper" award. 02/24/14 : Poster Accepted to GTC 2014 Zhang, Wang, Lin and Feng have their poster — cuBLASTP: Fine-Grained Parallelization of Protein Sequence Search on a GPU — accepted into the GPU Technology Conference (GTC) to be held in San Jose, CA, USA in March 2014. 02/10/14 : PhD Theses Accepted to PhD Forum at IEEE IPDPS 2014 Scogland has his PhD thesis research, "Runtime Adaptation for Autonomic Heterogeneous Computing" and Subramaniam has his PhD thesis research, "Metrics, Models and Methodologies for Energy-Proportional Computing," accepted into the PhD Forum at IEEE IPDPS 2014. 01/31/14 : del Mundo Receives Outstanding Senior Award The Department of Electrical and Computer Engineering at Virginia Tech selects Carlo del Mundo for the Outstanding Senior Award of 2014. 01/29/14 : Paper Accepted to IEEE/ACM CCGrid 2014 Subramaniam and Feng have their paper — Enabling Efficient Power Provisioning for Enterprise Applications — accepted into the 14th IEEE/ACM International Symposium on Cluster, Cloud and Grid Computing (CCGrid), to be held in Chicago, Illinois, USA in May 2014. 1/14/14 : PhD Thesis Accepted to PhD Forum at IEEE IPDPS 2014 Aji has his PhD thesis research, "A Runtime System for High-Performance Clusters with Heterogeneous Computing Devices," accepted into the PhD Forum at IEEE IPDPS 2014. 01/01/14 : MS Graduate from the Synergy Lab 01/01/14 Congratulations to Lokendra Panwar for receiving his MS degree for "Performance Modeling, Optimization, and Characterization on Heterogeneous Architectures." Best wishes to him as he embarks on a career at Amazon! 12/12/13 : Honorable Mention for CRA Outstanding Undergraduate Researcher Carlo del Mundo, an undergraduate in the Synergy Lab, received an Honorable Mention from the Computing Research Association (CRA) in the 2014 Outstanding Undergraduate Researcher Awards Competition. 12/08/13 : Papers Accepted to IEEE IPDPS 2014 Wang and Feng in collaboration with McClure of Advanced Research Computing at Virginia Tech and Miller and Prins at the University of North Carolina have their paper — Petascale Application of a Coupled CPU-GPU Algorithm for Simulation and Analysis of Multiphase Flow Solutions in Porous Medium Systems — and Zhang, Wang, Lin and Feng have their paper — cuBLASTP: Fine-Grained Parallelization of Protein Sequence Search on a GPU — accepted for publication into the 28th IEEE International Parallel and Distributed Processing Symposium 2014, to be held in Arizona, Phoenix, USA in May 2014. 11/22/13 : Winner of ACM Student Research Competition at IEEE/ACM SC|13 del Mundo was awarded the gold medal in the ACM Student Research Competition at SC|13, held in Denver, Colorado in November 2013, for his work on Enabling Efficient Intra-Warp Communication for Fourier Transforms in a Many-Core Architecture. 09/11/13 : Paper Accepted to Journal of Parallel Computing 2013 Gardner, Sathre, Feng, and Martinez have their paper — Characterizing the Challenges and Evaluating the Efficacy of a CUDA-to-OpenCL Translator — accepted for publication in a special issue of the Journal of Parallel Computing, 2013. 09/10/13 : Papers Accepted to IEEE ICPADS 2013 Adhinarayanan and Feng have their paper — Wideband Channelization for Software-Defined Radio via Mobile Graphics Processors — Krommydas, Scogland and Feng have their paper — Accelerating Molecular Modeling on Heterogeneous Architectures — Krommydas and Feng have their paper — On the Portability of the OpenCL Dwarfs on Fixed and Reconfigurable Parallel Platforms — and Lokendra, Aji and Feng have their paper — Online Performance Projection for Clusters with Heterogeneous GPUs — accepted into the 19th IEEE International Conference on Parallel and Distributed Systems (ICPADS), to be held in in Seoul, Korea in December, 2013. 09/09/13 : Poster Accepted to ACM/IEEE SC|13 del Mundo has his submission entitled — Enabling Efficient Intra-Warp Communication for Fourier Transforms in a Many-Core Architecture — accepted into the ACM/IEEE Supercomputing Student Research Competition, to be held in Denver, Colorado in November 2013. 09/01/13 : MS Graduate from the Synergy Lab Congratulations to Nabeel M. Mohamed for receiving his MS degree for "Data-Intensive Biocomputing in the Cloud." Best wishes to him as he embarks on a career at EMC Systems! 08/15/13 : Paper Accepted to IEEE HPCC 2013 Zhang, Wang and Feng have their paper — Energy Efficiency Aware Consolidation for Heterogeneous System with GPUs — accepted into the 15th IEEE International Conference on High Performance Computing and Communications (HPCC 2013), to be held in Zhangjiajie, China in November, 2013. 07/01/13 : The 2nd Doctoral Degree from the Synergy Lab Congratulations to Dr. Shucai Xiao for receiving his PhD degree for "Generalizing the Utility of Graphics Processing Units in Large-Scale Heterogeneous Computing Systems.” He is the 2nd awardee of the Synergy Lab. Best wishes to him as he embarks on a career at AMD! 07/01/13 : Paper Accepted to IEEE GLOBECOM 2013 Kalim, Gardner, Brown and Feng have their paper — Cascaded TCP: Applying Pipelining to TCP for Efficient Communication over Wide-Area Networks — accepted into the IEEE GLOBECOM to be held in Atlanta, GA, USA in December 2013. 06/01/13 : The 1st Doctoral Degree from the Synergy Lab Congratulations to Dr. Marwa Elteir for earning her PhD degree for "A MapReduce Framework for Heterogeneous Computing Architectures.” She is the first PhD graduate of the Synergy Lab. Best wishes on her job at City of Scientific Research and Technological Applications, Egypt. 05/01/13 : MS Graduate from the Synergy Lab Congratulations to Paul D. Sathre for receiving his MS degree for "On the Complexity of Robust Source-to-Source Translation from CUDA to OpenCL." 04/26/13 : Best Undergraduate Poster Award at VTURCS 2013 del Mundo receives the Best Undergraduate Poster Award at the Virginia Tech Undergraduate Research in Computer Science (VTURCS) Research Symposium 2013, as selected by the CS@VT faculty. 04/24/13 : Sathre Receives Outstanding M.S. Student Award The Department of Computer Science at Virginia Tech selects Sathre as the Outstanding M.S. Student of 2013. 04/24/13 : Paper Accepted to IGCC 2013 Subramaniam, Scogland and Feng in collaboration with Saunders at Intel have their paper — Trends in Energy-Efficient Computing: A Perspective from the Green500 — accepted into the 4th International Green Computing Conference to be held in Arlington, VA USA in June 2013. 04/24/13 : ACM ICPE 2013 Best Paper Award Subramaniam receives the Best Paper Award for his paper — Towards Energy-Proportional Computing for Enterprise-Class Server Workloads — published in the 4th ACM/SPEC International Conference on Performance Engineering (ICPE 2013). 03/17/13 : Paper Accepted to ICCCN 2013 Kalim, Gardner, Brown and Feng have their paper — Seamless Migration of Virtual Machines Across Networks — accepted into the International Conference on Computer Communications and Networks (ICCCN) to be held in Nassau, Bahamas in July-August 2013. 03/17/13 : Paper Accepted to ACM HPDC 2013 Aji, Panwar and Feng, in collaboration with Ji and Ma at North Carolina State University, Balaji, Dinan and Thakur at Argonne National Lab, Bisset at Virginia Bioinformatics Institute, and Chabbi, Murthy and Mellor-Crummey at Rice University have their paper — On the Efficacy of GPU-Integrated MPI for Scientific Applications — accepted into the 22nd ACM International Symposium on High Performance Parallel and Distributed Computing (HPDC), to be held in New York, NY, USA in June 2013. 02/25/13 : Paper Accepted to IEEE ICDCS 2013 Aji and Feng, in collaboration with Lama and Zhou at University of Colorado at Colorado Springs, Li and Zhang at Chinese Academy of Sciences, Balaji, Dinan and Thakur at Argonne National Lab and Xiao at Advanced Micro Devices have their paper — pVOCL: Power-Aware Dynamic Placement and Migration in Virtualized GPU Environments — accepted into the 33rd IEEE International Conference on Distributed Computing Systems (ICDCS 2013), to be held in Philadelphia, PA in July 2013. 02/25/13 : Paper Accepted to IEEE AsHES 2013 Aji and Feng, in collaboration with Balaji, Dinan and Thakur at Argonne National Lab have their paper — Synchronization and Ordering Semantics in Hybrid MPI+GPU Programming — accepted into the 3rd IEEE International Workshop on Accelerators and Hybrid Exascale Systems (AsHES 2013) (in conjunction with the 27th IEEE International Parallel and Distributed Processing Symposium), to be held in Boston, MA in May 2013. 01/27/13 : Paper Accepted to IEEE ICC 2013 del Mundo, Adhinarayanan and Feng have their paper — Accelerating Fast Fourier Transform for Wideband Channelization — accepted into the IEEE International Conference on Communications (ICC), to be held in Budapest, Hungary, in June 2013. 1/21/13 : Paper Accepted to IEEE/ACM CCGrid 2013 Zhang, Lin and Feng have their paper — Optimizing Burrows-Wheeler Transform-Based Sequence Alignment on Multicore Architectures — accepted into the 13th IEEE/ACM International Symposium on Cluster, Cloud and Grid Computing (CCGrid), to be held in Delft, the Netherlands, in May 2013. 12/30/12 : Paper Accepted to BICoB 2013 Nabeel, Lin and Feng have their paper — Accelerating Data-Intensive Genome Analysis in the Cloud — accepted into the 5th International Conference on Bioinformatics and Computational Biology (BICoB 2013), to be held in Honolulu, Hawaii, USA, in March, 2013. 12/16/12 : Paper Accepted to ACM/SPEC ICPE 2013 Subramaniam and Feng have their paper — Towards Energy-Proportional Computing for Enterprise-Class Server Workloads — accepted into the 4th ACM/SPEC International Conference on Performance Engineering (ICPE), to be held in Prague, Czech Republic in April, 2013. 10/01/12 : MS Graduate from the Synergy Lab Congratulations to Kenneth Lee for receiving his MS degree for "Characterization and Exploitation of GPU Memory Systems." Best wishes to him as he embarks on a career at Qualcomm! 09/14/12 : Submissions Accepted to the ACM/IEEE SC|12 Doctoral Showcase Aji and Scogland have their submissions to the SC|12 Doctoral Showcase Program accepted; Subramaniam has his submission to the Early Doctoral Showcase Program accepted. 09/08/12 : Poster Accepted to ACM/IEEE SC|12 Kalim, Gardner, Brown and Feng have their poster — Cascaded TCP: Big Throughput for Big Data Applications in Distributed HPC — accepted at ACM/IEEE Supercomputing, to be held in Salt Lake City, Utah in November 2012. 09/02/12 : Synergy Lab Releases Lessons for Storytelling Alice Synergy Lab releases 7 Storytelling Alice lessons as part of the MyVICE@VT project. Among other goals, the project aims to create an engaging and "kid-friendly" curriculum so as to improve the quality of IT education holistically from elementary school through high school. 08/25/12 : Gardner Appointed to an Affiliate Faculty Position The Department of Computer Science at Virginia Tech has appointed Dr. Mark Gardner as an affiliate faculty, where he will continue to be actively involved in research and collaboration between the Office of Information Technology and the Department of Computer Science, particularly the Synergy Lab. 08/16/12 : del Mundo Receives Two Scholarships Carlo del Mundo, a junior in Electrical and Computer Engineering, receives the David B. Osborn Merit Scholarship and Joe & Roberta May EE Merit Scholarship. 6/14/12 : Synergy Lab Awarded PGI Accelerator Compiler Suite The Synergy Lab at Virginia Tech has been awarded PGI Accelerator Compiler Software, which includes OpenACC compilers for C and Fortran as well as CUDA Fortran, CUDA x86, and traditional x86 Compilers, to support its research in heterogeneous computing. 6/8/12 : Paper Accepted to P2S2 2012 Sathre, Gardner and Feng have their paper — Lost in Translation: Challenges in Automating CUDA-to-OpenCL Translation — accepted into the 5th International Workshop on Parallel Programming Models and Systems Software for High-End Computing (P2S2) (in conjunction with 41st International Conference on Parallel Processing), to be held in Pittsburgh, PA in September 2012. 6/6/12 : Release of OpenDwarfs (a.k.a. OpenCL and the 13 Dwarfs) As part of a NSF CHREC-funded project entitled "Performance, Programmability, and Portability of Heterogeneous Computing," the Synergy Lab announces the availability of OpenDwarfs (version 0.9.0). For a preview of OpenDwarfs, please read OpenCL and the 13 Dwarfs from the ACM/SPEC International Conference on Performance Engineering in April 2012. 4/23/12 : Papers Accepted to IEEE HPCC 2012 Aji and Feng, in collaboration with Dinan, Buntinas, Balaji and Thakur at Argonne National Lab, and Bisset at Virginia Bioinformatics Institute (NDSSL) have their paper — MPI-ACC: An Integrated and Extensible Approach to Data Movement in Accelerator-Based Systems — and Aji and Feng, in collaboration with Ji and Ma at North Carolina State U. and Dinan, Buntinas, Balaji and Thakur at Argonne National Lab have their paper — DMA-Assisted, Intranode Communication in GPU Accelerated Systems — accepted into the 14th IEEE International Conference on High Performance Computing and Communications (HPCC 2012), to be held in Liverpool, UK, in June 2012. 4/9/12 : Paper Accepted to IEEE AsHES Aji and Feng, in collaboration with Ji and Ma at NCSU and Dinan, Buntinas, and Balaji at Argonne National Laboratory have their paper — Efficient Intranode Communication in GPU-Accelerated Systems — accepted into the 2nd IEEE International Workshop on Accelerators and Hybrid Exascale Systems (in conjunction with the 26th IEEE International Parallel and Distributed Processing Symposium), to be held in Shanghai, China, in May 2012. 4/9/12 : Paper Accepted to IEEE HPPAC 2012 Subramaniam and Feng have their paper — The Green Index: A Metric for Evaluating System-Wide Energy Efficiency in HPC System — accepted into the 8th IEEE Workshop on High-Performance, Power-Aware Computing (in conjunction with the 26th IEEE International Parallel and Distributed Processing Symposium), to be held in Shanghai, China, in May 2012. 4/6/12 : Paper Selected Among Best in 20 Years of IEEE/ACM HPDC Lin, Feng, and Gardner, in collaboration with Archuleta and with Ma and Zhang from NCSU, have their paper — MOON: MapReduce On Opportunistic eNvironments — selected as one of the best papers in the 20 years of IEEE/ACM HPDC publications. It will be published in a special proceedings issue at HPDC 2012 in Delft, Netherlands. 3/26/12 : Feng Receives Turner Fellowship Feng is named the Elizabeth and James Turner Associate Professor of Computer Science via a five-year Turner Fellowship. Read More. 3/20/12 : Aji Awarded NVIDIA Graduate Fellowship Ashwin Aji was awarded a 2012-2013 NVIDIA Graduate Fellowship for his research in high-performance computing. Approximately 10 students are selected each year in this highly competitive worldwide competition. Last year's awardees were from MIT, Stanford U., U. Edinburgh, KAIST, U. Utah, and U. Illinois. 3/6/12 : Papers Accepted to ISC 2012 Lee, Lin and Feng have their paper — Performance Characterization of Data-Intensive Kernels on AMD Fusion Architectures; Scogland, Subramaniam and Feng have their paper — The Green500 List: Escapades to Exascale; and Subramaniam and Feng have their paper — GBench: Benchmarking Methodology for Evaluating the Energy Efficiency of Supercomputers — accepted into the International Supercomputing Conference (ISC) 2012 to be held in Hamburg, Germany in June 2012. 2/27/12 : Papers Accepted to ACM/SPEC ICPE 2012 Braithwaite, Feng and McCormick have their paper — Automatic NUMA Characterization using Cbench — and Feng, Lin, Scogland and Zhang have their paper — OpenCL and the 13 Dwarfs: A Work In Progress — accepted into the 3rd ACM/SPEC International Conference on Performance Engineering to be held in Boston, MA in April 2012. 2/23/12 : PhD Thesis Accepted to PhD Forum at IEEE IPDPS 2012 Xiao has his PhD thesis research — Generalizing the Utility of GPUs in Large-Scale Heterogeneous Computing Systems — accepted into the PhD Forum at IEEE IPDPS 2012. His work is also nominated for a student travel award. 2/10/12 : Paper Accepted to InPar 2012 Xiao, Balaji, Lin, Feng and team of researchers at Argonne National Laboratory have their paper — VOCL: An Optimized Environment for Transparent Virtualization of Graphics Processing Units — accepted into the IEEE Innovative Parallel Computing (InPar2012), to be held in San Jose, CA, in May 2012. 02/01/12 : MS Graduate from the Synergy Lab Congratulations to Ryan Braithwaite for receiving his MS degree for "NUMA Data-Access Bandwidth Characterization and Modeling." Best wishes to him on his new job at Los Alamos National Lab! 1/31/12 : Paper Accepted to IEEE/ACM CCGrid 2012 Xiao, Lin and Feng and team of researchers at Argonne National Laboratory and Chinese Academy of Sciences have their paper — Transparent Accelerator Migration in a Virtualized GPU Environment — accepted into the IEEE/ACM International Symposium on Cluster, Cloud and Grid Computing (CCGrid), to be held in Ottawa, Canada in May 2012. 12/19/11 : HokieSpeed Unveiled Virginia Tech unveils HokieSpeed at #11 on the Green500 and #96 on the TOP500. It is the highest-ranked commodity supercomputer in the U.S. on the Green500, topping out at 928.96 MFLOPS/watt. Feng serves as the principal investigator for this project, which was supported by the Major Research Instrumentation (MRI) program at NSF. Articles: [HPCwire] [Wired] Videos: [Vimeo] [WSLS]. 12/16/11 : Demonstration: Virtual Machine Migration Across Networks Kalim, Brown and Gardner demonstrated a prototype solution for Virtual Machine Migration beyond local area networks. This artifact, demonstrated to Juniper Networks, was an outcome of their research on communication contexts. 12/13/11 : Paper Accepted to IPDPS 2012 Scogland and Feng, in collaboration with Rountree and de Supinski at Lawrence Livermore National Laboratory, have their paper — Heterogeneous Task Scheduling for Accelerated OpenMP — accepted into the 26th IEEE International Parallel and Distributed Processing Symposium, to be held in Shanghai, China in May 2012. 11/30/11 : Paper Accepted to ReConFig 2011 Lin and Feng, in collaboration with Pereira and Athanas of ECE, have their paper — Spectral Method Characterization on FPGA and GPU Accelerators — accepted into the International Conference on ReConFigurable Computing and FPGAs, to be held in Cancun, Mexico in November-December 2011. 11/17/11 : HokieSpeed: Highest-Ranked Commodity Supercomputer in the U.S. on the Green500 HokieSpeed debuted on the November 2011 Green500 List as the highest-ranked commodity supercomputer in the U.S. It is a GPU-accelerated supercomputer consisting of 209 2U server nodes, where each node contains two hex-core Intel Xeon E5645 CPUs, two 448-core NVIDIA M2050/C2050 GPUs, and a QDR Infiniband adapter. When running the LINPACK benchmark, HokieSpeed achieved 117 TFLOPS in a thermal envelope of 126 kW. 11/11/11 : NIH Grant Awarded in Bioinformatics Onufriev and Feng receive a $1-million NIH grant for Analytical Electrostatics: Methods and Biological Applications. 10/24/11 : Paper Accepted to BMC Bioinformatics Daga and Feng have their paper — Multi-Dimensional Characterization of Electrostatic Surface Potential Computation on Graphics Processors — accepted into a special issue of BMC Bioinformatics. 10/24/11 : Paper Accepted to BMC Genomics Aji and Feng, in collaboration with Bisset and Marathe of VBI, have their paper — High-Performance Biocomputing for Simulating the Spread of Contagion over Large Contact Networks — accepted for publication in a special issue of BMC Genomics. 09/21/11 : Feng in Microsoft's Testimony to U.S. House of Representatives Feng and the Synergy Lab receive a mention in Microsoft's testimony to the U.S. House of Representatives as part of the hearing on "The Next IT Revolution? : Cloud Computing Opportunities and Challenges." The testimony notes the lab's work in data-intensive biocomputing. 09/05/11 : Multiple Papers Accepted to IEEE ICPADS Elteir, Lin, and Feng have their paper — StreamMR: An Optimized MapReduce Framework for AMD GPUs — accepted into the 17th IEEE International Conference on Parallel and Distributed Systems (ICPADS), to be held in Tainan, Taiwan, December 7-9, 2011. Wu, Lin, and Feng have an accepted paper, entitled Optimizing Dynamic Programming on Graphics Processing Units via Adaptive Thread-Level Parallelism. Daga, Scogland, and Feng have an accepted paper, entitled Architecture-Aware Mapping and Optimization on a 1600-Core GPU. Martinez, Gardner and Feng also have an accepted paper, entitled CU2CL: A CUDA-to-OpenCL Translator for Multi- and Many-core Architectures. 08/25/11 : Feng Receives AMD Research Faculty Fellowship Advanced Micro Devices has awarded Wu-chun Feng a fellowship to support his research in heterogeneous computing, graphics processing units (GPUs), and accelerated processing units (APUs). 08/21/11 : Poster Accepted to ACM/IEEE SC|11 Lee, Lin and Feng have their poster — Characterizing the Impact of Memory-Access Techniques on AMD Fusion — accepted at ACM/IEEE Supercomputing, to be held in Seattle, WA in November 2011. 07/06/11 : Paper Accepted into the International Journal of Parallel Programming Feng, in collaboration with Cao, Patnaik, Ramakrishnan, and others, have their work entitled Parallel Mining of Neuronal Spike Streams on Graphics Processing Units — accepted for publication in the International Journal of Parallel Programming. This journal paper is an extended version of the conference paper, which appeared in ACM Computing Frontiers 2010. 06/21/11 : Paper Accepted to IEEE Cluster 2011 Elteir, Lin and Feng have their paper — Performance Characterization and Optimization of Atomic Operations on AMD GPUs — accepted into the IEEE Cluster 2011 to be held in Austin, TX, USA in September 2011. 06/07/11 : Paper Accepted to SAAHPC 2011 Daga, Aji, and Feng have their paper — On the Efficacy of a Fused CPU+GPU Processor for Parallel Computing — accepted into the Symposium on Application Accelerators in High-Performance Computing to be held in Knoxville, Tennessee in July 2011. 06/01/11 : MS Graduate from the Synergy Lab Congratulations to Gabriel Martinez for receiving his MS degree for "CU2CL: A CUDA-to-OpenCL Translator for Multi- and Many-Core Architectures." Best wishes to him on his new job at Intel! 06/01/11 : MS Graduate from the Synergy Lab Congratulations to Mayank Daga for receiving his MS degree for "Architecture-Aware Mapping and Optimization on Heterogeneous Computing Systems." Best wishes to him as he embarks on a career at AMD! 05/15/11 : Daga Receives Outstanding M.S. Student Award The Department of Computer Science at Virginia Tech selects Mayank Daga as the Outstanding M.S. Student of 2011. 05/06/11 : Book Chapter Accepted to Encyclopedia of Parallel Computing Feng and Lin have a book chapter entitled From Homology to Sequence Alignment that will appear in the Encyclopedia of Parallel Computing, to be published in May 2011. 04/28/11 : "Compute the Cure" Award to Analyze Genomes Using GPUs Feng, in collaboration with Mittelman from VBI, secures the first worldwide research award from NVIDIA Foundation's "Compute the Cure" program. The $100,000 award will be used to create a flexible framework for genome analysis. 04/21/11 : Paper Accepted to ICCCN 2011 Brown, Gardner, Kalim and Feng have their paper — Restoring End-to-End Resilience in the Presence of Middleboxes — accepted into the 20th IEEE International Conference on Computer Communications and Networking (ICCCN) to be held in Maui, Hawaii in July-August 2011. 04/12/11 : Paper Accepted to ICME 2011 Krommydas and Feng, in collaboration with Christos Antonopoulos and Nikos Bellas of the University of Thessal, have their paper — AVS Video Decoder on Multicore Systems: Optimizations and Tradeoffs — accepted into the IEEE International Conference on Multimedia and Expo (ICME) to be held in Barcelona, Spain in July 2011. 4/1/11 : Feng Appointed as Adjunct Faculty at the Virginia Bioinformatics Institute The Virginia Bioinformatics Institute at Virginia Tech has appointed Feng as an Adjunct Faculty Member. 02/12/11 : Paper Accepted to ACM CF 2011 Aji, Daga and Feng have their paper — Bounding the Effect of Partition Camping in GPU Kernels —accepted into the ACM International Conference on Computing Frontiers to be held in Ischia, Italy on May 3, 2011. 02/09/11 : Paper Accepted to HPPAC 2011 Scogland, Subramaniam and Feng have their paper — Emerging Trends on the Evolving Green500: Year Three —accepted into the 7th Workshop on High-Performance, Power-Aware Computing (HPPAC) to be held in Anchorage, Alaska, USA on May 16, 2011. 01/28/11 : Feng on HPCwire's People to Watch List for 2011 Feng is named to the “HPCwire People to Watch List” for 2011. It is the second such honor for Feng, who was named to the same list in 2004. 01/10/11 : Paper Accepted to ICCABS 2011 Daga, Scogland, and Feng have their paper — Towards Accelerating Molecular Modeling via Multi-Scale Approximation on a GPU — accepted into the 1st IEEE International Conference on Computational Advances in Bio and Medical Sciences (ICCABS) to be held in Orlando, Florida in February 2011. 01/10/11 : Paper Accepted into the Journal of Cluster Computing Lin, Ma and Feng have their work entitled Reliable MapReduce Computing on Opportunistic Resources — accepted for publication in the Journal of Cluster Computing, 2011. 01/10/11 : Paper Accepted to ICCABS 2011 Aji and Feng, in collaboration with Bisset and Marathe, have their paper — High-Performance Biocomputing for Simulating the Spread of Contagion over Large Contact Networks — accepted into the 1st IEEE International Conference on Computational Advances in Bio and Medical Sciences (ICCABS) to be held in Orlando, Florida in February 2011. 12/12/10 : Paper Accepted to IPDPS 2011 Xiao, Lin, and Feng have their paper — Accelerating Protein Sequence Search in a Heterogeneous Computing System —accepted into the 25th International Parallel and Distributed Processing Symposium to be held in Anchorage, Alaska in May 2011. 12/01/10 : Paper Accepted into the Journal Standards in Genomic Sciences Gilbert, Meyer, Antonopoulos, Balaji, Brown, Desai, Eisen, Evers, Field, Feng, Huson, Jansson, Knight, Kolker, Konstantindis, Kostka, Kyrpides, Mackelprang, McHardy, Quince, Raes, Sczyrba, Shade, and Stevens have their work entitled The Terabase Metagenomics Workshop and the Vision of an Earth Microbiome Project — accepted for publication in the Standards in Genomic Sciences, 2010. 11/18/10 : Feng Interviewed by HPCwire Feng is interviewed by HPCwire to discuss the greening of high performance computing, his contributions and approach to research. 11/17/10 : ACM Distinguished Scientist Award Feng is recognized as an ACM Distinguished Scientist in recognition of achievements and contributions to "practical and theoretical aspects of computing that drive innovation and sustain economic competitiveness," as noted in the ACM press release. 11/01/10 : Paper Accepted into the Journal of Concurrency and Computation Balaji, Feng, Lin, Archuleta in collaboration with Matsuoka, Warren, Setubal, Lusk, Thakur, Foster, Katz, Jha, Shinpaugh, Coghlan and Read have their work entitled Global-Scale Distributed I/O with ParaMEDIC — accepted for publication in the Concurrency and Computation: Practice and Experience, 2010. 10/28/10 : Paper Accepted to PFLDNeT 2010 Kalim, Brown, Gardner, and Feng, have their paper — Enabling Renewed Innovation in TCP by Establishing an Isolation Boundary —accepted into the 8th International Workshop on Protocols for Future, Large-Scale and Diverse Network Transports (PFLDNeT) to be held in Lancaster, Pennsylvania in November 2010. 10/28/10 : Feng Quoted in The New York Times Feng is quoted in The New York Times on a story about China wresting supercomputing supremacy from the U.S.
10/20/10 : Paper Accepted to IEEE CSE Aji and Feng, in collaboration with Liqing Zhang, have their paper — GPU-RMAP: Accelerating Short-Read Mapping on Graphics Processors — accepted into the 13th IEEE International Conference on Computational Science and Engineering (CSE) to be held in Hong Kong, China in December 2010. 10/1/10 : Feng Appointed as Adjunct Faculty at Wake Forest University Wake Forest University has appointed Feng as an Adjunct Associate Professor in the Dept. of Cancer Biology and the Translational Science Institute in the School of Medicine. 09/16/10 : Feng Delivers Keynote at EnA-HPC Feng provided the opening keynote speech entitled "Energy-Efficient Exascale Computing: An Oxymoron?" at the International Conference on Energy-Aware High-Performance Computing in Hamburg, Germany in September 2010. 09/07/10 : Poster Accepted to GTC Daga and Feng have their poster — Accelerating Molecular Modeling Using GPUs — accepted for presentationin the GPU Technology Conference (GTC) to be held in San Jose, CA, USA in September 2010. 09/05/10 : Paper Accepted to ICPADS Elteir, Lin, and Feng have their paper — Enhancing MapReduce via Asynchronous Data Processing — accepted for publication at the 16th International Conference on Parallel and Distributed Systems (ICPADS) to be held in Shanghai, China in December 2010. 06/23/10 : Paper Accepted to EnA-HPC Scogland, Lin, and Feng have their paper — A First Look at Integrated GPUs for Green High-Performance Computing — accepted for publication in the International Conference on Energy-Aware High-Performance Computing to be held in Hamburg, Germany in September 2010. 05/15/10 : Paper Accepted to ICCCN Feng, in collaboration with Sushant Sharma and Donald Gillies of Qualcomm, have his paper, On the Goodput of TCP NewReno in Mobile Networks —accepted for publication in the 19th International Conference on Computer Communication Networks to be held in Zurich, Switzerland in August 2010. 04/19/10 : Feng Delivers Keynote at HPPAC Feng provided the opening keynote speech entitled "Green Supercomputing Comes of Age" at the 6th Workshop on High-Performance, Power-Aware Computing (HPPAC), held in conjunction with the 24th IEEE International Parallel and Distributed Processing Symposium (IPDPS) in April 2010. 04/07/10 : Paper Accepted to Journal of Molecular Graphics and Modelling Scogland and Feng, in collaboration with Ramu Anandakrishnan, Andrew Fenley, John Gordon, and Alexey Onufriev, have their paper — Accelerating Electrostatic Surface Potential Calculation with Multi-Scale Approximation on Graphics Processing Units — accepted for publication in the Journal of Molecular Graphics and Modelling. 03/28/10 : Paper Accepted to IEEE TPDS Lin and Feng, in collaboration with Xiaosong Ma and Nagiza Samatova at Oak Ridge National Lab, have their paper — Coordinating Computation and I/O in Massively Parallel Sequence Search — accepted for publication in IEEE Transactions on Parallel and Distributed Systems. 03/24/10 : Paper Accepted to ACM HPDC Lin, Archuleta, Feng, and Gardner, in collaboration with Xiaosong Ma and Zhe Zhang at North Carolina State University have their paper — MOON: MapReduce On Opportunistic eNvironments — accepted for publication at the ACM International Symposium on High-Performance Distributed Computing to be held in Chicago, IL, USA in June 2010. 03/03/10 : Paper Accepted to BMC Bioinformatics Archuleta and Feng, in collaboration with Andrew Warren and Joao Setubal at the Virginia Bioinformatics Institute, have their paper — Missing Genes in the Annotation of Prokaryotic Genomes — accepted for publication in BMC Bioinformatics. 02/19/10 : Paper Accepted to ACM CF Feng et al. have their paper — Towards Chip-on-Chip Neuroscience: Fast Mining of Neuronal Spike Streams Using Graphics Hardware — accepted for publication at the ACM International Conference on Computing Frontiers (CF) to be held in Bertinoro, Italy in May 2010. 01/29/10 : Paper Accepted to IEEE IPDPS Workshop on High-Performance, Power-Aware Computing Feng and Lin have their paper — The Green500 List: Year Two — accepted for publication at the 24th IEEE International Parallel & Distributed Processing Symposium (IPDPS) to be held in Atlanta, GA, USA in April 2010. 01/08/10 : Paper Accepted to IEEE ISCAS Feng and Xiao have their paper — To GPU Synchronize or Not GPU Synchronize? —accepted for publication at the IEEE International Symposium on Circuits and Systems (ISCAS) to be held in Paris, France in May-June 2010. 12/08/09 : Paper Accepted to IEEE IPDPS Xiao and Feng have their paper — Inter-Block GPU Communication via Fast Barrier Synchronization — accepted for publication at the 24th IEEE International Parallel and Distributed Processing Symposium (IPDPS) to be held in Atlanta, GA, USA in April 2010. 11/30/09 : Two Honorable Mentions for CRA Outstanding Undergraduate Researcher Jacqueline Addesa and Gabriel Martinez, two undergraduates in the Synergy Lab, each receive Honorable Mention from the Computing Research Association in the 2010 Outstanding UndergraduateResearcher Awards Competition. 11/19/09 : ACM Best Undergraduate Poster Award at ACM/IEEE SC|09 Addesa receives the “Best Undergraduate Poster Award” as part of the ACM Student Research Competition at ACM/IEEE SC|09. In recognition of her efforts, Addesa received a monetary award, certificate, and travel expenses paid. 11/19/09 : The Latest Green500 List Released At the ACM/IEEE SC|09 Conference, the latest Green500 List was announced at the Green500 List Birds-of-a-Feather(BoF). For more information, go to the Green500 web site. 10/16/09 : Scientific American: New Software Could Smooth Supercomputing Speed Bumps Feng talks about turning to the emerging Open Computing Language, and the work done by Feng and Scogland, in collaboration with Alexey Onufriev and his research group, in Scientific American, read here. 10/06/09 : Interview about Green Computing on National Public Radio (NPR) Feng is interviewed on WVTF’s NPR about his efforts in green computing in southwest Virginia. For the audio, click here. 10/04/09 : Paper Accepted to ICVCI Gardner, Herr, Mazary, Lin, Scogland, and Feng have their paper — A Flexible and Extensible Framework for Delivering Designer Images for K-12 Pedagogy — accepted for publication at the 3rd International Conference on the Virtual Computing Initiative in Raleigh, NC, USA in October 2009. 09/01/09 : Paper Accepted to ICPADS Xiao, Aji, and Feng have their paper — On the Robust Mapping of Dynamic Programming onto a Graphics Processing Unit — accepted for publication at the 15th International Conference on Parallel and Distributed Systems (ICPADS) to be held in Shenzhen, China in December2009. 07/01/09 : MS Graduate from the Synergy Lab Congratulations to Ajeet Singh for receiving his MS degree for "GePSeA: A General-Purpose Software Acceleration Framework for Lightweight Task Offloading." Best wishes to him as he embarks on a career at Epic Systems! 06/30/09 : Feng Featured in insideHPC Podcast Feng talks about green high-performance computing (HPC), along with Wilf Pinfold ofIntel, Horst Simon of Lawrence Berkeley National Lab, and Dan Reed of Microsoft, in Episode 1 of Green HPC: A Look Beyond the Hype. 05/21/09 : Paper Accepted into ICPP Singh and Feng, in collaboration with Pavan Balaji at Argonne National Lab, have their paper —GePSeA: A General-Purpose Software Acceleration Framework for Lightweight Task Offloading — acceptedinto the 38th International Conference onParallel Processing (ICPP) to be held in Vienna, Austria in September 2009. 05/15/09 : Outstanding M.S. Student Award The College of Engineering at Virginia Tech selected Ashwin Aji as the Outstanding M.S. Student of 2009. 04/15/09 : 3 Papers Accepted to IPDPS and Associated Workshops The Synergy Lab has an accepted paper to the IEEE Parallel and Distributed Processing Symposium (IPDPS) entitled Multi-Dimensional Characterization of Temporal Data Mining on Graphics Processors as well as two papers in the Workshop on High-Performance, Power-Aware Computing (HPPAC). 04/15/09 : Paper Accepted to IEEE CCGrid Huang and Feng have an accepted paper entitledEnergy-Efficient Cluster Computing via Accurate Workload Characterization — which will appear in the 9th IEEEInternational Symposium on Cluster Computing and the Grid in Shanghai, China on May. 18-21, 2009. 04/14/09 : NDSEG Fellowship Award Scogland receives prestigious fellowship from the National Defense Science and EngineeringGraduate Fellowship program through the American Society forEngineering Education. 04/01/09 : MAOP Award Addesa was awarded an undergraduate summer research award by the Virginia Tech Multicultural Academic Opportunities Program (MAOP). 12/22/08 : Featured on /. The SyMMer research of Scogland et al., which was recently published and presented at ACM/IEEE SC|08, was featured on /. 12/01/08 : Paper Accepted to HiPC Feng has an accepted paper entitled Making a Case for Proactive Flow Control in Optical Circuit-Switched Networks — which will appear in the 15th IEEE International Conference on High Performance Computing in Bangalore, India, December 2008. 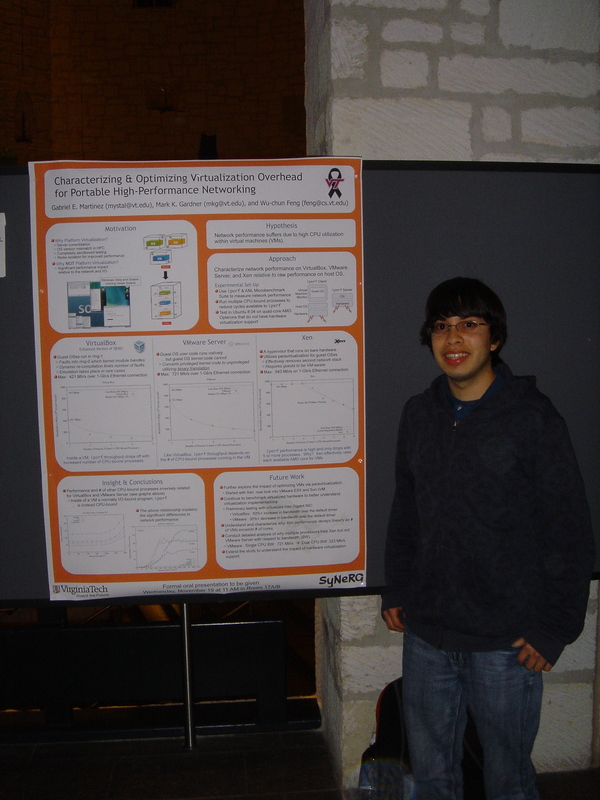 11/20/08 : SC|08 Best Undergraduate Poster Award Martinez, a CS junior, wins the ACM Student Research Competition at SC|08 for his poster entitled Characterizing and Optimizing Virtual Machines for High-Performance Networking with Gardner and Feng. Here is a high-resolution picture of Gabriel and the poster. 10/31/08 : SURA IP2M Award Feng and Huang win the Southeastern Universities Research Association (SURA) "Intellectual Property to Market" (IP2M) competition for their entry EcoDaemon: Power-Aware Systems Software. The invention ranked first among submissions from 60+ research institutes in the Southeast as well as U. Maryland and MIT. 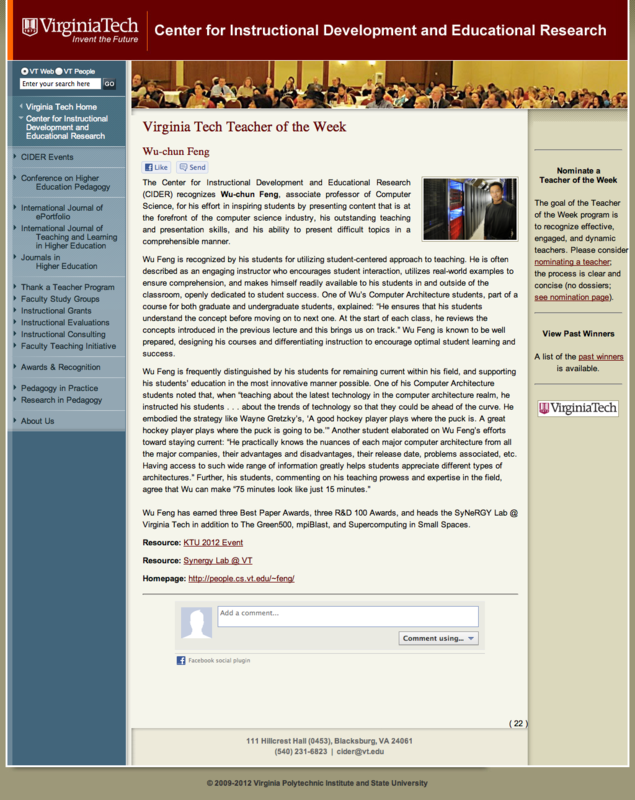 See the VTnews release. 10/08/08 : Program Co-Chair for 5th IEEE HPPAC Feng was selected as program co-chair, along with Laurent Lefevre of INRIA, for the 5th IEEE Workshop on High-Performance, Power-Aware Computing (HPPAC), which will occur on May 25, 2009. 09/01/08 : IBM Faculty Award Feng receives IBM faculty award for his innovations in large scale bioinformatics. 08/18/08 : Workshops Chair for IEEE Cluster 2009 Feng was selected as the Workshops Chair for the 11th International Conference on Cluster Computing, which will be held on September 4, 2009 in New Orleans, LA. 08/02/08 : Multiple Papers Accepted to ACM/IEEE SC|08 Feng has an accepted paper, co-authored with collaborators from NCSU, ANL, and IBM, entitled Massively Parallel Genomic Sequence Search on the Blue Gene/P Architecture — which will appear in ACM/IEEE SC|08 in Austin, TX on Nov. 17-21, 2008. Scogland and Feng also have an accepted paper, co-authored with ANL, entitledAsymmetric Interactions in Symmetric Multi-core Systems. 08/01/08 : New NSF Grant Awarded in Green Computing Synergy Lab receives NSF CISE grant for Metrics And Methodologies for High Performance System Energy Benchmarking. 08/01/08 : CREU Award From CRA-W and CDC Feng and Undergraduate students, Martinez and Gomez receive award for collaborative research experience for undergraduates (CREU) for a proposal entitled "Virtual Ecosystems for K-12 Pedagogy in Science, Technology, Engineering, and Mathematics". This award was sponsored by the Computing Research Association's Committee on the Status of Women in Computing Research (CRA-W) and the Coalition to Diversify Computing. 07/31/08 : Paper Accepted to IEEE BIBE 2008 Aji and Feng have an accepted paper entitled Optimizing Performance, Cost, and Sensitivity in Pairwise Sequence Search on a Cluster of PlayStations — which will appear in the IEEE International Conference on BioInformatics & BioEngineering in Athens, Greece on Oct. 8-10, 2008. 06/28/08 : IBM Faculty Award Feng received an IBM Faculty Award for innovations in large-scale bioinformatics, as exemplified by mpiBLAST and recent parallel transformations to bioinformatics codes on emerging chip multiprocessing platforms such as the Cell and GPGPU. 06/22/08 : Workshops Co-Chair for ICPP 2009 Feng was selected as the Workshops Co-Chair, along withLeonard Barolli of Fukuoka Institute of Technology, for the , which will be held September 22-25, 2009 in Vienna, Austria. 06/01/08 : ISC'08 Distinguished Paper Award Archuleta and Feng have an accepted paper, co-authored with an international team of collaborators, entitled Distributed I/O with ParaMEDIC: Experiences with a Worldwide Supercomputer, that has been bestowed the ISC'08 Distinguished Paper Award and will be presented at the International Supercomputing Conference(ISC) in Dresden, Germany on June 15-20, 2008. 06/01/08 : MS Graduate from the Synergy Lab Congratulations to Ashwin Aji for receiving his MS degree for "Exploiting Multigrain Parallelism in Pairwise Sequence Search on Emergent CMP Architectures." 05/22/08 : Accepted Talk at the 16th International Conference on Intelligent Systems for Molecular Biology Feng, along with collaborators from IBM and North Carolina State University, have been invited to present the following talk atISMB 2008 in Toronto, Canada on July 19-23, 2008: Next Generation of Selected Bioinformatics Applications: Using Massively ParallelSupercomputers. 05/01/08 : MS Graduate from the Synergy Lab Congratulations to Ganesh Narayanaswamy for receiving his MS degree for "On the Interaction of High-Performance Network Protocol Stacks with Multicore Architectures." Best wishes to him as he embarks on a career at Cisco! 04/11/08 : Paper Accepted to ACM/IEEE International Symposium on High-Performance Distributed Computing Feng has an accepted paper, co-authored with Balaji and Lin of Argonne National Laboratory and North Carolina State University, respectively, entitled Semantic-based Distributed I/O with the ParaMEDIC Framework, which will appear in the ACM/IEEE International Symposium on High-Performance Distributed Computing in Boston, MA on June 23-27, 2008. 03/12/08 : Paper Accepted to ACM International Conference on Computing Frontiers Aji and Feng have an accepted paper, co-authored with Blagojevic and Nikolopoulos of Virginia Tech, entitled Cell-SWat: Modeling and Scheduling Wavefront Computations on the Cell Broadband Engine, which will appear in the ACM International Conference on Computing Frontiers in Ischia, Italy on May 5-7, 2008. 02/14/08 : Narayanaswamy Receives Outstanding M.S. Student Award The College of Engineering at Virginia Tech selected Ganesh Narayanaswamy as the Outstanding M.S. Student of 2008. 01/24/08 : Paper Accepted to IEEE IPDPS Workshop on High-Performance, Power-Aware Computing Huang and Feng have an accepted paper, co-authored with Yan Luo (U. Massachusetts), entitled "Modeling and Analysis of Power in Multicore Network Processors," which will appear in the IEEE IPDPS Workshop on High-Performance, Power-Aware Computing in Miami, FL on April 14, 2008. 01/21/08 : Feature Article on Green Computing in IT Professional Feng et al. land the "Cover Feature" article for the January/February 2008 issue of IT Professional with an article entitled Green Supercomputing Comes of Age. 01/01/08 : The Synergy Lab Receives NSF Grant for Genome Sequencing with a SmartNIC Wu Feng, director of the Synergy Lab at Virginia Tech, and Gerald Sabin of RNet Technologies received a National Science Foundation Small Business Technology Transfer (STTR) grant of $150,000 for the first phase of a research project entitled Network Offloading for Genome Sequence Searching using the SmartNIC. 09/01/07 : MS Graduate from the Synergy Lab Congratulations to Chris Goddard for receiving his MS degree for "Analysis and Abstraction of Parallel Sequence Search." Best wishes to him on his new job at Context Computing!